Morgan Bettes, owner of Independent Jones promotions and event planning business, left, and Mike Gold, owner of B’Towne Coffee Company, 440 Old Main St., Bradenton, say they are planning the best New Year’s Eve party on Old Main Street ever. If you want to see a lighted ball drop with a partying throng of revelers on New Year’s Eve but cannot get to Times Square in New York City there is a local solution — Old Main Street in Bradenton. The Old Main Street Merchants Association has been sponsoring a New Year’s Eve party on the two blocks north of Manatee Avenue West in downtown Bradenton for more than 13 years. 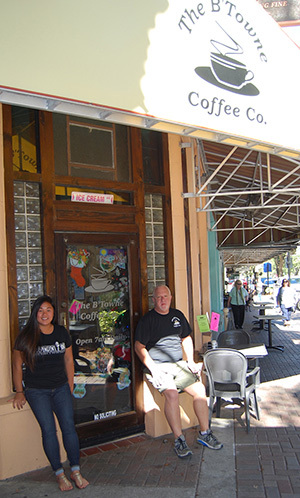 “The New Year’s Eve is typically one of the biggest events of the year in downtown Bradenton,” said Mike Gold, treasurer of the business group and owner of the B’Towne Coffee Company. “It’s two blocks packed elbow to elbow like Times Square. The fun starts at 6 p.m. with the band The Beat Downs playing for about two hours, said Morgan Bettes, owner of Independent Jones, an event planning and promotional company. Then, Have Gun, Will Travel, a local band that has become nationally recognized, will take the stage around 9 p.m. and play until the crowd rings in the New Year. 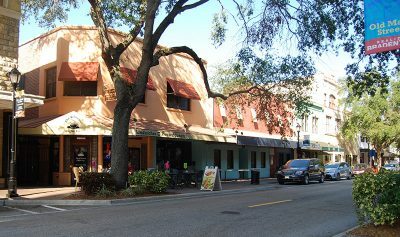 Merchandise and craft vendors selling T-shirts, art, jewelry, wooden goods and other articles will line both sides of Old Main Street from Manatee to Third avenues west. The street will be closed to vehicle traffic at 2:30 p.m. and will reopen sometime after midnight when the Bradenton Police Department deems it is safe for traffic, according to a press release from Tim McCann, public information officer for the city. Bettes said this will be a family-oriented event with plenty of activities for children, such as caricature artists and face painting. There also will be vendors and food trucks serving tacos, crepes, soft pretzels, pizza, shaved-ice cones, and other delicious fare, she said. But it will be the bands that keep the partygoers in the celebratory mood, Bettes said. 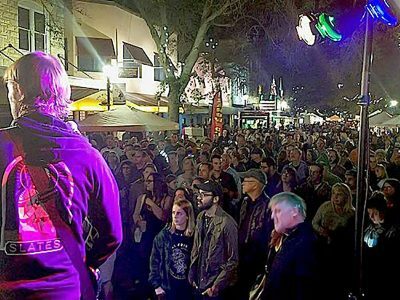 The Sarasota-based rock and roll band, The Beat Down, will open for a nationally known band with Bradenton roots, Have Gun, Will Travel. This alternative folk-rock band started in 2006 and makes reference to Bradenton in several songs, including “Salad Days” from the album “Postcards from the Friendly City,” according to promotional information on the band’s website. 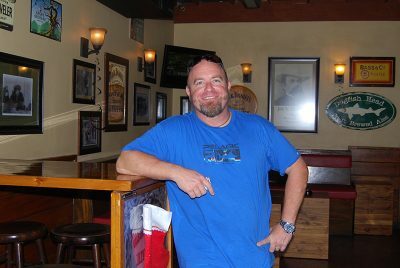 Paul Kotlarczyk, owner of The Loaded Barrel Tavern, 405 Old Main St., said the New Year’s Eve party on Old Main Street is a good event to experience for people who have never been to downtown Bradenton. This is the second year Bettes has organized the New Year’s Eve event for the business owners’ group. She also puts together the monthly Main Street Live events for them. Gold said when the merchants’ association began holding the New Year’s Eve event about 14 years ago, they had an events manager, but she moved away and the association picked up operating it themselves. Bettes had worked as an executive associate for Realize Bradenton, a non-profit organization working with the City of Bradenton and the Downtown Development Authority to promote redevelopment and economic growth downtown, before she branched out to start her own business. Bettes, 28, moved to Bradenton from Oshkosh, Wis., about seven years ago. She has a degree in business marketing and graphic design from University of Wisconsin, Oshkosh, and started her firm, Independent Jones, with a partner, Wade Hamilton, about three years ago. The company books entertainment for local events and businesses, runs the Lakewood Ranch Farmers’ Market, organizes private events and does other social promotion work. Bettes said they started the company after speaking with a lot of young Manatee County residents referred to as millennials. “They wanted more nightlife, more things to do, more live music,” she said. “Downtown has lot of great bars and restaurants, but there’s not much outside of downtown. “So, we try to provide something different,” Bettes said. Gold said the merchants group was started about 13 years ago after he opened his downtown business, B’Towne Coffee Company, 440 Old Main St., Bradenton. Another downtown group was doing promotions, but had disbanded, he said. “The purpose was to keep downtown events going so the interest in downtown Bradenton is maintained,” Gold said. During the day, downtown Bradenton workers breaking for lunch and vehicle traffic visit Old Main Street, but on Dec. 31, thousands will jam the two-block long street for the Old Main Street New Year’s Eve party. Merchant association member Paul Kotlarczyk, owner of The Loaded Barrel Tavern, 405 Old Main St., said he also thought that people should come to downtown Bradenton. 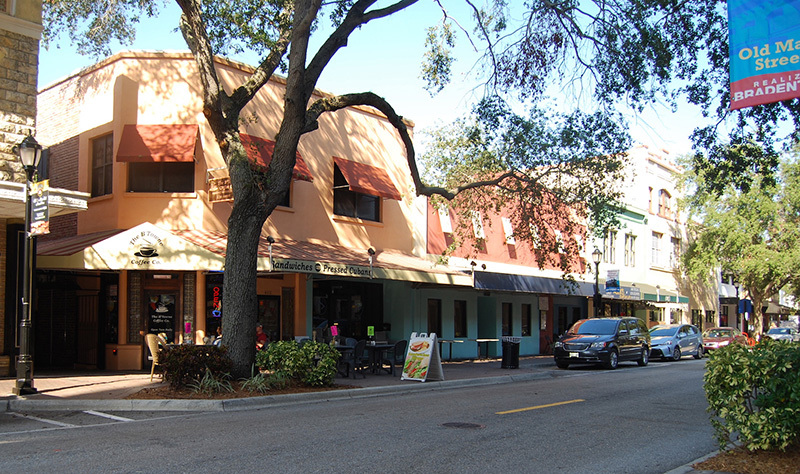 He suggested the New Year’s Eve party on Old Main Street as a good event to experience for people who have never been to downtown Bradenton. For more information about the merchant association, visit its Facebook page at www.facebook.com/OldMainStreetMerchantsAssociation. And to learn more about Bettes and her booking company, go to www.facebook.com/independentjones/. 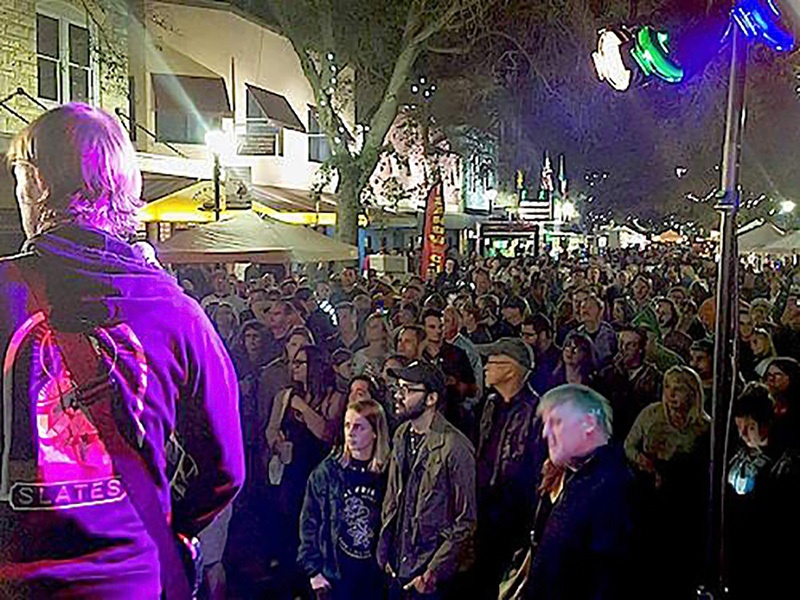 Thousands of people came to Old Main Street in downtown Bradenton last year to ring in the new year. The Old Main Street Merchants Association will sponsor the event again this year.